Recently, I went to see a small exhibition, around 60 works, of Andy Warhol's work in Perth. Now, everyone knows Warhol's name, everyone knows at least one image. He is an omnipotent phantom of contemporary consciousness, perpetuated by bad parodies and quotations out of context. 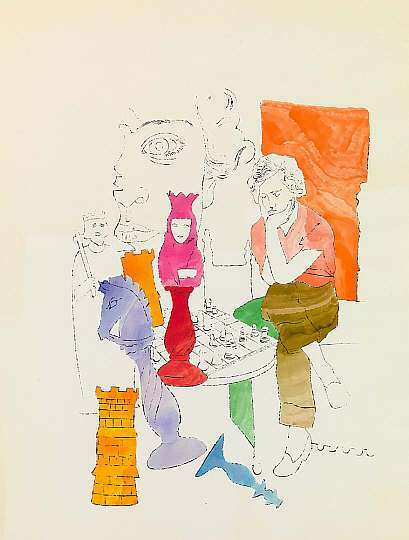 However, despite all of that, when you stand in front of Chess Players (1954), every aphorism and assumption you've ever made or heard about Warhol is forgotten upon seeing each individual line and stroke of the picture. You realise that Warhol actually created art, as well as creating creations and visualising ideas in the works we're all most familiar with. I also found the stitch paintings to be remarkably more engaging in the flash. Reproductions remove all the aspects that he purposefully left in, the process of creation becoming an aspect of the final piece. Photographs themselves are so easily reproduced, especially in the "digital age", that being able to witness the overlapping and the relationships between these images, all the same image yet different as each is a singular component, brought the importance of physical print and notions of mass production to the forefront of my thoughts. This may have been a predictable outcome, but it was not done by an image of Marilyn Monroe of Campbell's soup.